The National Library of Russia is pleased to present the distinguished Churakov collection. It is the largest single collection of views of world towns in the post-cards section of the Print Department's holdings. The Churakov collection holds over 55,000 post-cards, dated between the late 1890s and 1941. Half the collection describes domestic towns and cities. In geographic scope it covers the gigantic territory that was once the Russian Empire (and then the Soviet Union). The other half includes material for foreign countries, and especially for Germany, France and Switzerland. The outstanding collection was formed by the engineer-economist and member of Leningrad Collector Society, Igor Churakov. He amassed the items between 1904 and 1941. The Library acquired the collection in 1941 - 1942. It received the carefully arranged post-cards, stored in 238 albums, and unsorted material in four boxes. The Churakov collection is particularly strong in the material relating to our city. 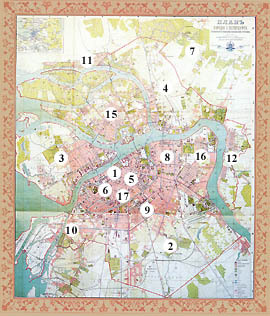 About 900 images of Saint Petersburg (Petrograd-Leningrad) are available online and can be viewed via the web. The post-cards are grouped into separate pages for two periods: from 1900 to 1917 and from 1918 to 1941. Figures at the top of each page indicate the corresponding period. Select desired years and then click on the figures. This gives you the chance to travel time and see the city evolve over the decades. Please follow the links below and experience the pre-revolutionary history of Saint Petersburg (1900-1917). All titles and names from the collection have been transliterated to the Latin character set.